Considering doing a Facebook Live Broadcast? We are in the middle of a live video revolution at the moment, where everyone has the ability to go live via their platform of choice, with Facebook Live now the dominant platform. Periscope has fallen in popularity since Facebook Live launched and RIP Meerkat and Blab! 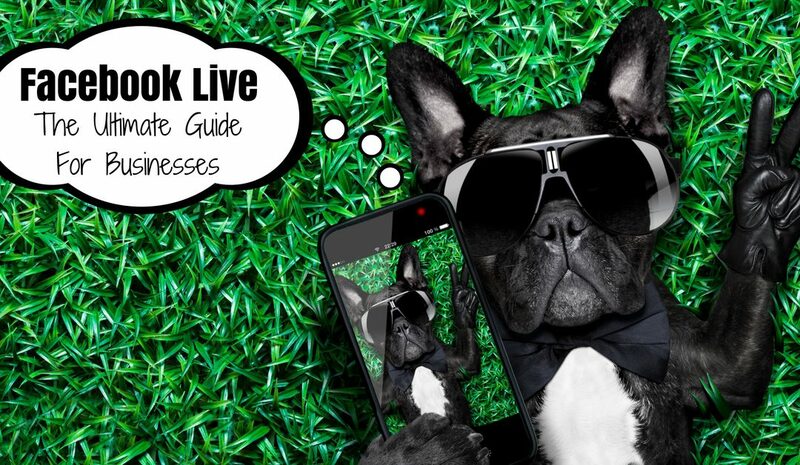 If used effectively, Facebook Live Broadcasts can be a great way to connect with your audience in a real and authentic way that can help build deeper relationships, as well as generate more leads and sales for your business. Going live is easy. All you have to do is click on the “Live Video” icon on Facebook from your mobile app, enter the subject and then go! 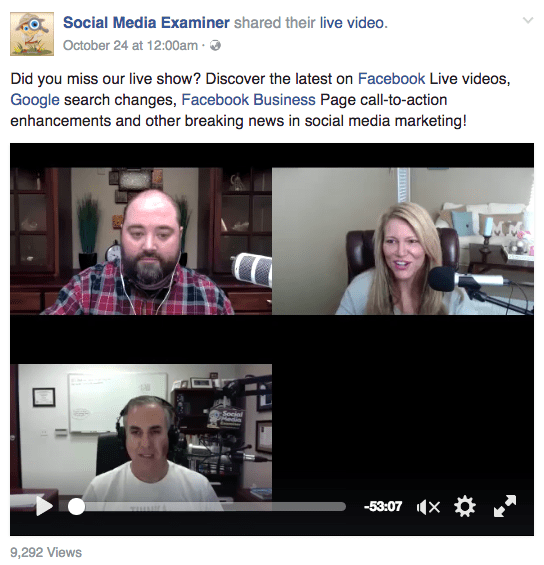 Social Media Examiner use Huzza to live broadcast their Morning Social Media Marketing Talk every Friday on Facebook. Broadcasting using software like this can also allow you to have multiple people broadcast simultaneously from different locations, switch between multiple camera angles or do some more fancy things, like include a lower-third title or watermark on your broadcast. Some of these platforms also allow you the ability to Live Broadcast to multiple platforms at the same time. For example, you could be live streaming to Facebook and YouTube simultaneously. If you want to be omnipresent, just make sure that you pay attention to the multiple comment streams that will be active whilst you are live! LiveLeap allows you to broadcast into multiple groups at the same time. I would not recommend Live Broadcasting into multiple groups (or even individual groups) without the permission of the group administrator. Facebook is also rolling out the ability for Verified Pages to go Live from your desktop, as well as two-party broadcast. I am looking forward to the time when this also includes the ability to pre-schedule your Live Broadcasts and have a waiting room for your audience, in a similar fashion to what is currently available using webinar software. You can also use an external camera for direct Live Broadcasting to Facebook. Mevo is the first camera that has been released with this functionality. What Should You Live Broadcast? Just be spontaneous and have some fun! As the accessibility and popularity of live broadcasting increases, there is the potential to be lost in the noise. You can avoid this by boosting the quality of your Facebook Live broadcast. Plan in advance – Put your Live Broadcasts in your calendar in advance and let your audience know when to expect to see you live. Be prepared – Create an outline of the key points you want to get across as part of your Live Broadcast. Use this as part of your introduction and mention this again throughout the broadcast so that people who join late have an understanding of what it is about. Also, know in advance what opt-in offer you are going to recommend to help build your subscriber list and have an easy to remember URL ready to share. Craft your broadcast title – Consider what title will draw in viewers. Check your audio – Make sure that you have a quality microphone and that the space that you are recording in is free from any loud or distracting background noises or reverberation. Clean your camera lens – Particularly if you are using your phone, as those things get super dirty. You may also consider using a different lens if you are after a different effect for your shot. Use a tripod or a stabiliser – Your phone can start to feel pretty heavy after a couple of minutes and having the camera constantly shaking or moving can be annoying for your viewers. Ensure you have sufficient battery power – You don’t want your broadcast to drop out early. Use WiFi – Facebook Live Broadcasts can chew through your data plan, so if this is an issue for you, then make sure that you are connected to WiFi prior to going Live. Check your bandwidth – close down anything that might be using bandwidth, such as Netflix, Dropbox syncing and any download or streaming. Use SpeedTest.net to check the strength (upload speed is more important than download speed). Have a backup connection ready – In case your main connection is not strong enough. Enable “Do Not Disturb” mode on your phone – This will block calls, preventing you from being booted out of your own Live Broadcast if someone calls. 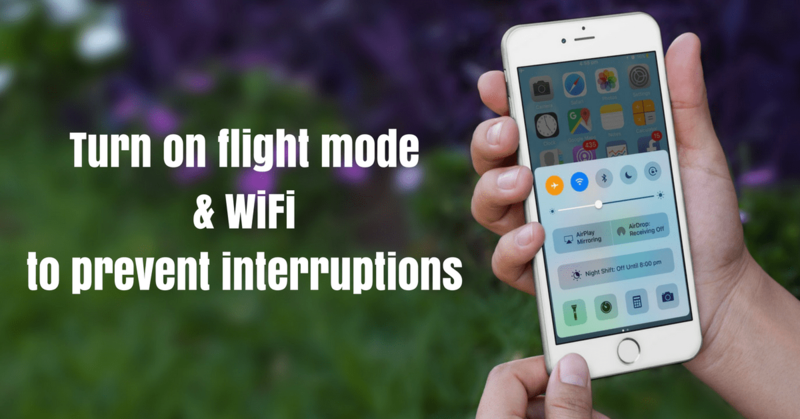 If you are using WiFi for your broadcast, you can turn on the Flight Mode, plus Wifi as another way to prevent interruptions from phone calls. You can also do a test run, particularly if you have never done a Facebook Live Broadcast before. You can achieve this by going Live, but selection “only me” as the audience. You can record a short clip and then watch it back to see that you are happy with the audio and visuals. If you are comfortable with the technology, then you might just want to do a quick normal “selfie” video instead (without going live) to check your audio and visuals. Start immediately – Don’t wait around for people to get online. Value the time of those present and start providing value from the start. Encourage people to turn on the volume – Your Live Broadcast will auto-play on mute in the news feed. You can encourage people to turn up the volume through your broadcast headline and visuals. Provide loads of value – Serve, don’t sell. People buy from people they know, like and trust. Use your Live Broadcast as your opportunity for people to get to know, like and trust you, so that by the time they are ready to buy what you have to offer, the competition are irrelevant. Bring the energy – Don’t be boring. You need to be energetic and engaging if you want to keep your viewers from tuning out. Be authentic – Live broadcasting gives you the opportunity to be you in all your unedited glory. Be yourself. Don’t put on an act as people will see straight through you. Share your Live Broadcast on other channels – This is only something you should do if you have help, as it is annoying as an early listener to your Broadcast if you are spending the first five minutes tweeting out the link to your Live Broadcast, but its a great thing to get another member of your team to post the direct link to your broadcast on your other social media platforms as soon as possible once you start broadcasting. You can also re-share your Live Broadcast to your own Facebook Page part way through the presentation, along with an update on what you are actually doing “now”. This is a particularly good strategy if you have been broadcasting for a while and the topic has changed or you are doing something significantly different than what you were doing at the start of the broadcast. Maintain eye contact with the lens – Stop looking at yourself on the screen! It’s OK to check occasionally to make sure everything is as it should be, but not all the time. Monitor your environment – Things change. Keep an eye on changes to background noise, lighting and any other distractions that may detract from your broadcast. Ask questions – Some of the best Live Broadcasts are two-way dialogues. By getting your audience to engage with you directly, you will increase their viewing time. Check and respond to comments – It’s important that you engage with your audience during your Live Broadcast. Respond to people by name and whilst you will have to look away to read the comments, make sure that you look at the lens when speaking to your audience. If people have questions, answer them live! Encourage your audience to share your Live Broadcast – This will increase the reach of your broadcast whilst you are still live, as well as after the event. Thank your audience – Show that you are genuinely grateful for their attendance and engagement. This will make them more likely to tune in again. Keep the replay in mind – Not everyone will be watching live, so consider the experience of those watching it via replay also. Include a call-to-action – Facebook Live can be a great way to build your email list if you alert your audience to an opt-in resource you have that is relevant to the content being shared on your broadcast. Promote notifications – Encourage your audience to get notified of your future broadcasts. Save the video – You may wish to repurpose all or part of the broadcast on other platforms. Welcome and brief introduction – Start by welcoming your viewers and letting them know a bit about you in just a couple of sentences, including who you are and what you do. Introduce the topic – Tell your viewers the topic you are going to cover and what they can expect to get out of your Live Broadcast. Deliver value – Share your insights, tips and tricks. Use stories and examples to make your content interesting, entertaining and inspiring. Don’t forget to mention your opt-in offer and/or main call-to-action at least a few times throughout your broadcast. Close – End strong with a clear call-to-action. People who are genuinely engaged want to be told what to do next, so tell them! Edit the text – The title of your broadcast that you set before you went live may not accurately reflect what the broadcast ended up being about. You can edit this after it has ended. At this time you may also wish to include a link to any resources you mentioned during the broadcast. Edit the thumbnail – Facebook is very good at choosing the most unflattering image of you to display as the thumbnail for your video. You can go in and change this image after the broadcast has finished. Review your performance – What can you improve for next time? Don’t delete your broadcast once it is finished – Unless it’s REALLY bad! Review the comments – Respond to anything that you didn’t get a chance to do whilst live and keep the conversation going to help increase the reach of your broadcast after the event. Share your broadcast – Share the URL to your broadcast on other social media channels and via email so that that that missed it live can watch it later. It’s also OK to re-share this link to your Facebook Page. Repeat – Do it again, again and again… Practice, practice, practice! Get into a rhythm of doing 1-2 Facebook Lives a week and you will be a pro in no time and your consistency will beat out all of your competition! 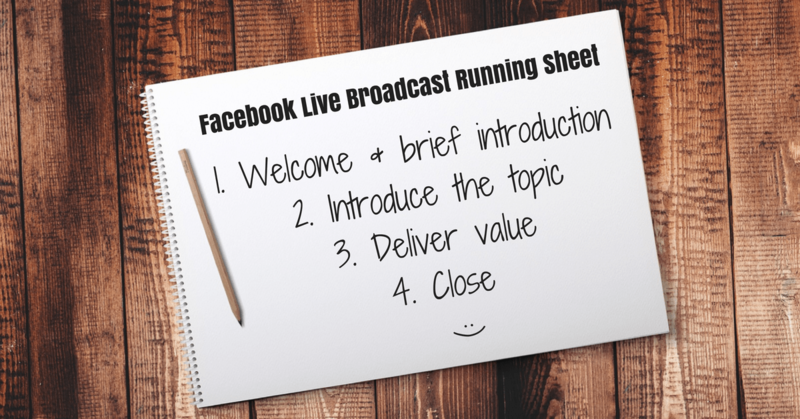 What are your top tips for broadcasting live on Facebook? Share them in the comments below so that we can learn from your experiences.